Greetings from Malawi, the Warm Heart of Africa. Peggy Beswick, my sister from Victoria and I have been in Malawi since May 9th and it has been a busy but rewarding trip. The weather has been cool and there actually have been a few days of rain which is unusual for this time of year. The rains generally come in January and February. The election was held on May 20th. People have taken their responsibility to vote very seriously. 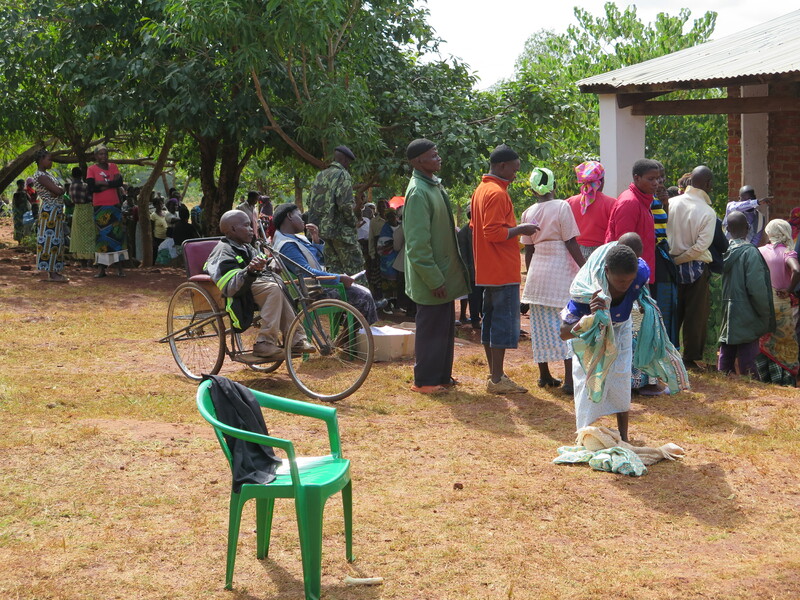 The villagers walked many kilometers to cast their vote. There were three ballots. One had all twelve Presidential candidates. The second ballot had all MP’s for the District and the third ballot had all Councillors for the constituency. Areas could have 6 Councillors and one MP in their District. People lining up to cast their vote. Unfortunately some of the ballots were not printed properly and had only 2 Presidential candidates on them so the voting was extended for another day after the ballots were reprinted. Everyone who votes dips their finger in black ink to ensure they don’t vote again and people who do not know how to use a pencil or pen are allowed to put a fingerprint beside the picture of the candidate they are choosing. The International Observers declared the voting to be fair and finally after a week, a new President has been elected. Everything is quiet now and people are looking forward to the country moving ahead. We have been encouraged by the work that is going on in all three of the regions. To check on the operation of some of the filters we went to a remote area in southern Malawi called Chikwawa. In 2010 we installed 3 filters up in a mountainous area that was only accessible by 4 wheel drive and on foot. We had installed them as a pilot to see if they would be used by the villagers and to see if they would be properly taken care of. We were very pleasantly surprised to see that all 3 are working well and providing clean water to several families. The villagers are asking for more filters so they don’t have to wait so long for clean water. 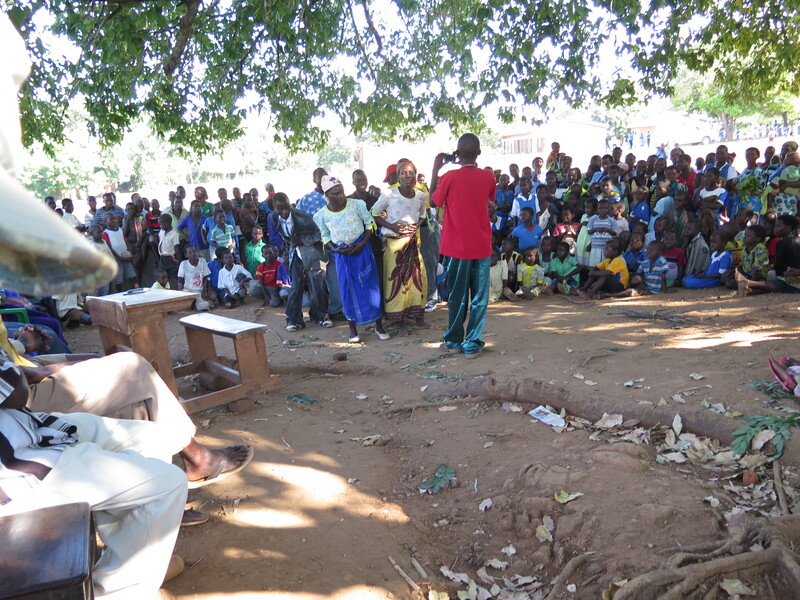 Our Community Health Promoters gave presentations to villages on water sanitation and hygiene. We attended meetings in the south and central regions. During a presentation one of the political candidates drove up to give a speech so we postponed the community health presentation to hear the candidate’s speech. Because many people who had come to hear the candidate stayed to hear the health presentation, we had a huge turnout of over 500 people. Since we had planned buns and drinks for 100 the team did some fast thinking and watered down the drinks and divided the buns so everyone was happy. In the north we helped make a filter and wash sand for installation. 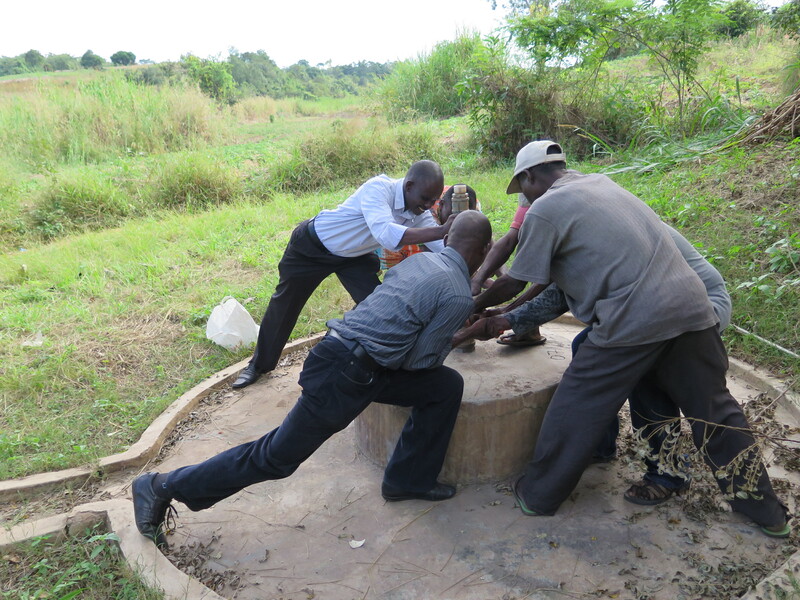 The deep well (borehole) pump that is used for water to wash the media for the filters had stopped working a few days before we arrived. Fortunately we were able to hire a service man who we picked up to come and repair the pump. He suggested that the platform be raised so that people, especially children, don’t break the seal by pulling the handle on an angle. We had two rows of bricks cemented on the existing platform to increase the height. 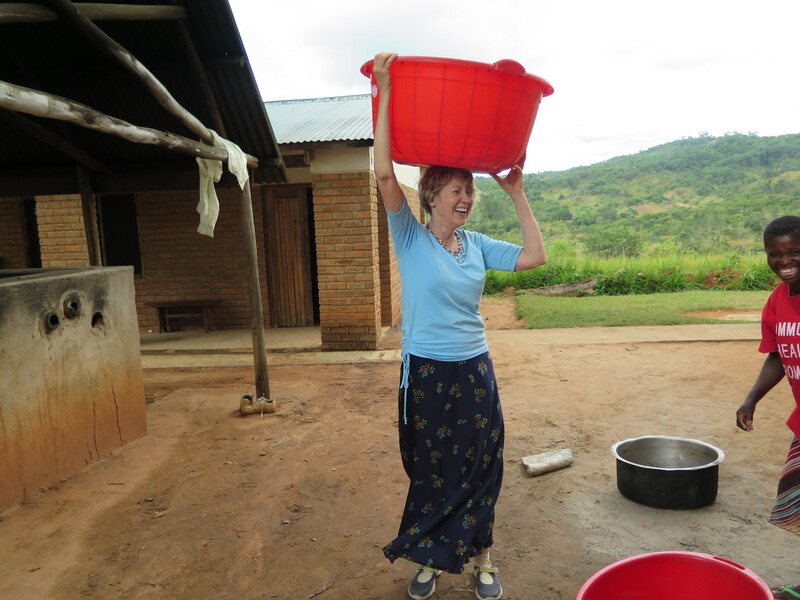 The Project pays women to carry pails of water up the hill to fill a huge water tank which is used to wash the sand and gravel. I tried to see if I could carry the 40 liter container with even a small amount of water and it fell off my head. It is so difficult to balance with the water moving from side to side in the container. Either my balance is off or I have a pointed head, maybe both. The Chief or Headman/woman of the village is notified that the Community Health Promoters will be coming to their village to give a presentation on proper sanitation and hygiene. The Chief informs the villagers of the date and time that the meeting will be held. The presentation is very interactive and the villagers participate by answering questions. Following the presentation on sanitation and hygiene, the Biosand Implementers explain all about the biosand filter and those who participated with questions and answers receive a bar of soap. People who sign up for the filter are asked to attend a half day training session on the filter and then are asked to come back another day to help construct their filter. The beneficiaries are asked to help sift and wash the sand and gravel under the supervision of the Biosand Implementers. They also receive instructions on how to care for their filter. Once the filter is ready and cured after 7 days the beneficiary transports the filter and the media to their home and the Implementers come to properly install it. Villagers are paying a small fee for their filter in two of the three areas so that they have a vested interest in maintaining it. They are expected to help build their filter in all three areas. The Community Health Promoters check on the filter after 7 days, 30 days, 90 days and then one year. To date 173 filters have been installed and all are working except one that is located in a school. Someone will need to be assigned to pour water daily through that filter when school is closed. Villagers are sharing their filter with others in their village so there are 1587 people using these filters. The demand has increased and we have over 650 families wanting filters. However, this number increases each time our Community Health Promoters give a presentation to a village on proper sanitation and hygiene. The health clinic at Mfera n Chikwawa is reporting that there haven’t been any cases of cholera in the villages since using the filters. 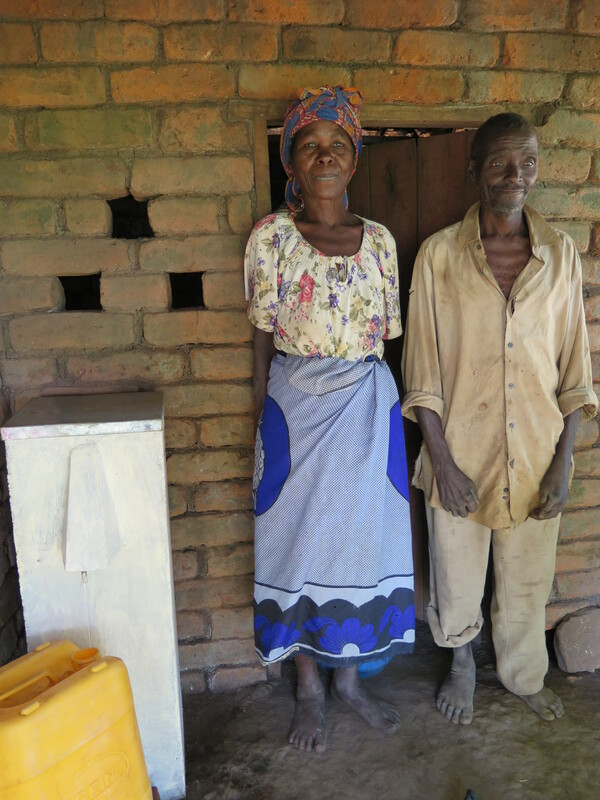 The beneficiaries have told us that their family members have not experienced incidents of diarrhea since using the filter. It is so good to see children feeling better and being able to play. The parents, especially the mom’s are very happy that their children are not suffering from water borne diseases. Superman and a soccer hero. The same all the world over. The Project is becoming known across the country and we have had requests from people working in remote areas where filters are badly needed because of cholera outbreaks especially in the rainy season. The water source is from streams, rivers and lakes where the water is contaminated because people are using the water source for washing clothes, bathing themselves and their children then using it for drinking. They need to be taught about proper sanitation and hygiene and need filters for their drinking water. Unfortunately, the cost of transporting filters and transporting our team members to these areas is very expensive. Fuel in Malawi is $2.15 USD per liter in a country where the majority of people are living on less than $1 US dollar per day. In order to access these very remote areas and carry the weight of the filters and media, a large capacity all-terrain vehicle is needed which we don’t have at this point. As well as reviewing the activities of the teams on the ground we reviewed the financial recording systems and the monthly monitoring reports. We were very pleased to find that all three Field Coordinators are keeping accurate up to date records. They have entered their receipts and keep a monthly log of income and expenditures on an Excel workbook which gets sent to me once a month. Also, with Net banking I can review their bank accounts on-line. The Field Coordinators are becoming very proficient in the use of their computers and they are emailing financial reports and monitoring reports on a monthly basis. It is amazing to receive reports by email from our three Field Coordinators, one of whom had never touched a computer before our two amazing volunteers, Ashif and Reeshma Bhura from Calgary, worked with him. Following our visit we are confident that the filters are being constructed, installed and maintained properly, teaching of proper sanitation and hygiene is being included regularly and the financial and monitoring reports are being completed accurately and on time. The country of Malawi is described as “The Warm Heart of Africa”. On my second visit to this extremely poor country, I was struck again as to why it is called this. The climate is warm and even very hot during parts of the year but for me, it is the people that provide the warmth referred to in this phrase. The people of Malawi are not only peace loving and generous with a shining sense of humor but they also have a strong Christian based faith which helps them in the face of their many adversities. Their extended family and community life is something to treasure as this is the strong foundation within which they are able to survive. The heartbreak of the death of a child or other loved one in these communities is a common and stark reality. I have visited many countries including those of the developing world. I have found the needs of the population in Malawi to be extreme by comparison. So much poverty, disease, lack of sanitation and clean water, especially in the remote villages, is hard for me to absorb. The depth of need for the basics of life, including safe water, is overwhelming. 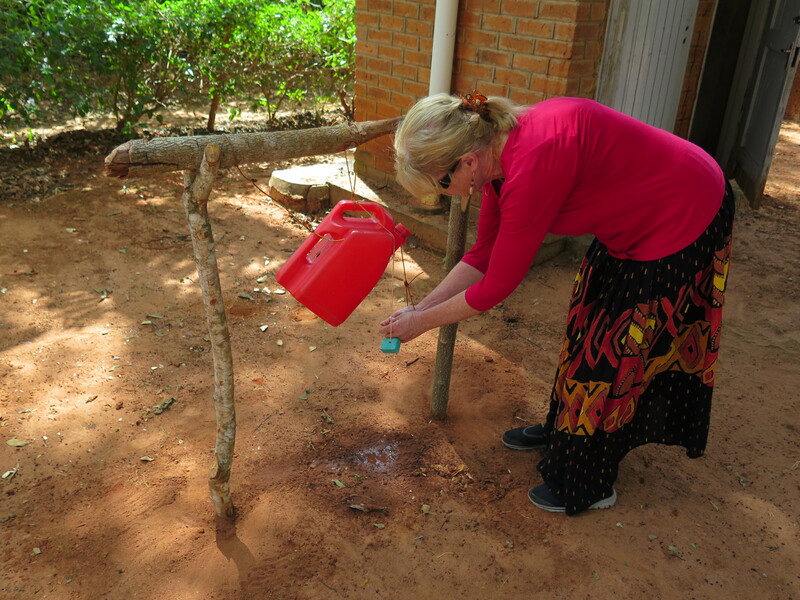 The Malawi Water Project is creating an awareness of the benefits of clean water. This awareness is growing by the day. Malawi people have a saying, “Water is Life”. Without this treasure their suffering will continue. Our goal for the coming year is to increase production of filters in each of the areas. We are very proud to be representing people from Canada (and our neighbors in the USA ) who like yourselves, care about our fellow human beings on the other side of the world. Although the villagers inMalawi may not have the material items that we enjoy they can live happy lives in their rural communities if they have clean water, proper sanitation and hygiene, enough food and access to health care. You are helping to meet three out of 5 of these very basic needs. 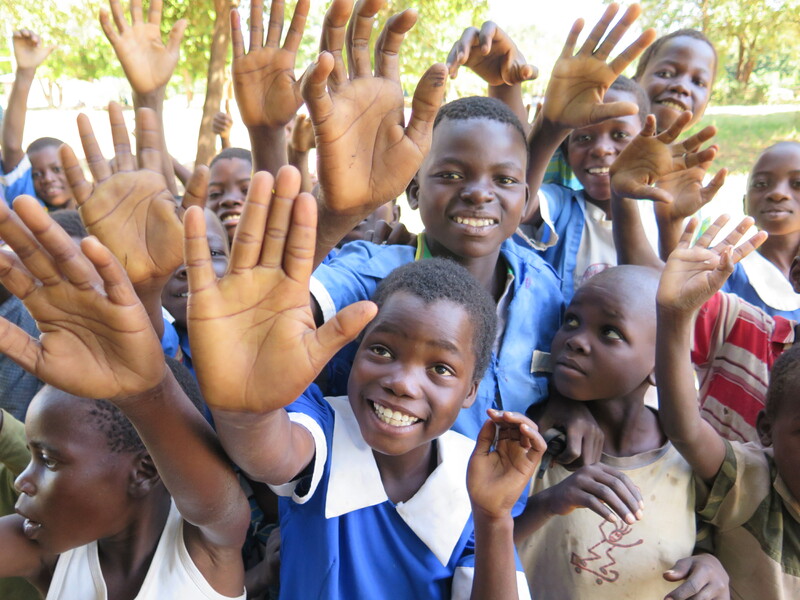 Malawi may not have the material items that we enjoy they can live happy lives in their rural communities if they have clean water, proper sanitation and hygiene, enough food and access to health care. You are helping to meet three out of 5 of these very basic needs. Unfortunately proper education is a luxury for most rural families since they cannot afford to send their children to boarding schools and pay school fees. All of the people we have met know about Canada and that it is a very cold country. They are most thankful for the help they are receiving. Their culture is one of sharing. Most of the people working in our Project are caring for nieces and nephews who are living with them. The extended family is very important and cousins who live under the same roof are referred to as brothers and sisters. Even though they have very little, the people here share whatever they can with us, so we always are fed a meal or are given gifts to bring home. 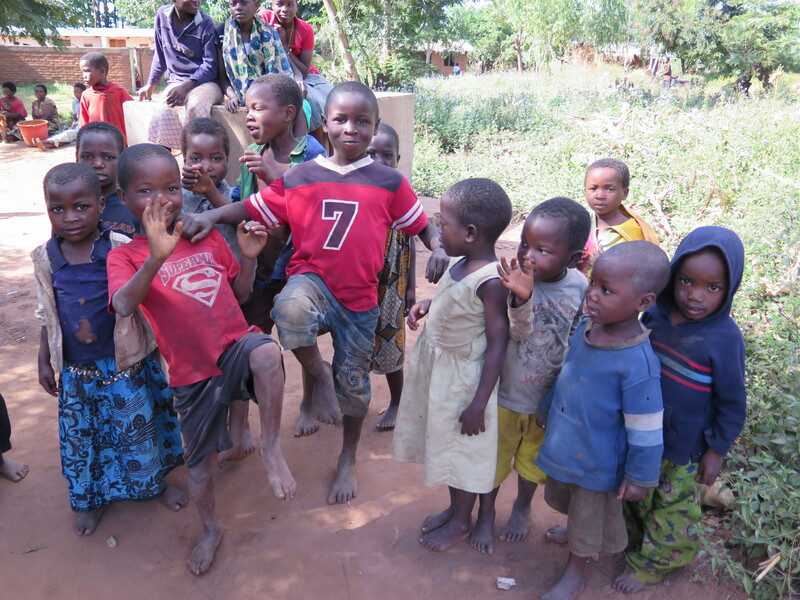 Zikomo (thank you ) from all the people who are benefiting from your help.